Most of us care about beauty and skin care as much as we care about our wallets. I feel you. You want to look fabulous, but you don’t want to spend all your hard earned money on expensive serums and face masks. Just because products are cheaper doesn’t mean they’re worse. There are plenty of affordable skin care products that work so you can have glowing skin without a heavy price tag! From drugstore toner to drugstore exfoliator, these are the best drugstore skin care products to invest in. Everyone should follow a skin care routine and if you’re on a budget, you can follow a drugstore skin care routine with the best cheap skin care products! Different skin types may require different products, but there are some foolproof steps you should follow no matter what type of skin you have. Follow these skin care basics for glowing skin! You should be cleansing your skin twice every day- once in the morning and once at night. No matter what skin type you have, cleansing is key to rid your skin of dirt and debris! Moisturizing your skin is a non-negotiable for any skin type. It’s key to keep your skin hydrated to ensure your complexion stays soft and youthful. Moisturize your skin day and night after you cleanse. The area under your eye is the only part of your skin that doesn’t create its own moisture, so it’s important you nourish it. It’s also one of the first areas that shows signs of aging. Use an under eye cream every day to keep the area young and fresh! Sunscreen is a crucial aspect of your skin care routine. Yes, even in the winter. UV rays can cause a lot of damage to your skin, so even if you’re sitting inside at a desk all day, if there are windows, you need to protect your skin. Rain or shine, sun or cloud, wear sunscreen every single day. Exfoliation also plays a key role in a healthy skin care routine. Exfoliate one to two times per week (or more if your skin can handle it) to remove dirt, oil and dead skin cells and you’ll be left with glowing skin. Make sure to remove your makeup every single night. It may seem like an unnecessary step in your routine, but sleeping with makeup can be more harmful than you think. Foundation and blush can lead to pesky breakouts and sleeping with mascara on can cause your lashes to fall out and can even scratch your cornea while you sleep. These facial bars are ideal if you’re prone to acne. They gently cleanse your skin, removing excess oil without leaving your skin feeling dry. They’re hypoallergenic and won’t clog your pores, leaving you with fresh, healthy-looking skin. This acne-fighting formula helps prevent breakouts and soothes your complexion. It contains salicylic acid (one of the best acne-fighting ingredients) to clear blemishes and prevent future breakouts. Use it day and night to moisturize your skin! If you have acne-prone skin, using an oil-free sunscreen is key. If it’s not oil-free it will likely break you out. This Sun Bum sunscreen is formulated with sensitive skin in mind and is SPF 50 so not only will you not have to worry about breakouts, you also won’t have to worry about burning your skin! This gentle facial cleanser is oil-free, making it ideal for oily skin. It removes dirt, oil and impurities and contains bursting beads to gently remove dead skin cells. It’s pretty much a cleanser and exfoliator all in one! Formulated with sensitive, oily skin in mind, this daily moisturizer is water-based, lightweight and non-greasy. It will leave your skin feeling soft and smooth and will help reduce the oiliness of your skin. If you’re looking for a good facial cleanser for dry skin, this one checks all the boxes. Formulated with hyaluronic acid, it helps maintain your skin’s natural moisture, and also works to remove dirt, oil and makeup. Vitamin E oil is a natural antioxidant, softening your skin and giving you a glowing look. Add a few drops to your moisturizer and serum to keep your skin hydrated all day and night! This lotion helps dissolve dead skin cells and impurities, and enhances the skin’s ability to retain moisture. It’s very soothing and will leave your skin feeling refreshed all day! This cleansing scrub promises a deep clean and gentle exfoliation for your softest skin yet! It helps eliminate dirt, dead skin cells and debris on your face, and with baking soda and Biore Skin Purifying Technology, you get a cleanse that’s 2.5 times cleaner than a regular cleanser. Your under eye area is one of the first areas on your face to show aging. This retinol eye cream reduces the signs of aging around the eyes, including crow’s feet, dark circles and puffiness. A lot of women forget about the neck when it comes to anti-aging, but your neck can be one of the major signs of getting older. This cream fight wrinkles and firms the skin, and contains beeswax and shorea robusta seed oil butter for extra moisture! Formulated with collagen peptides, this light weight face cream provides anti-aging effects, reducing the appearance of lines and wrinkles. It also contains SPF 25 so you get face cream and sunscreen in one! There you have it! 12 of the best drugstore skin care products to invest in! Whatever your skin type may be, try these products for glowing results! 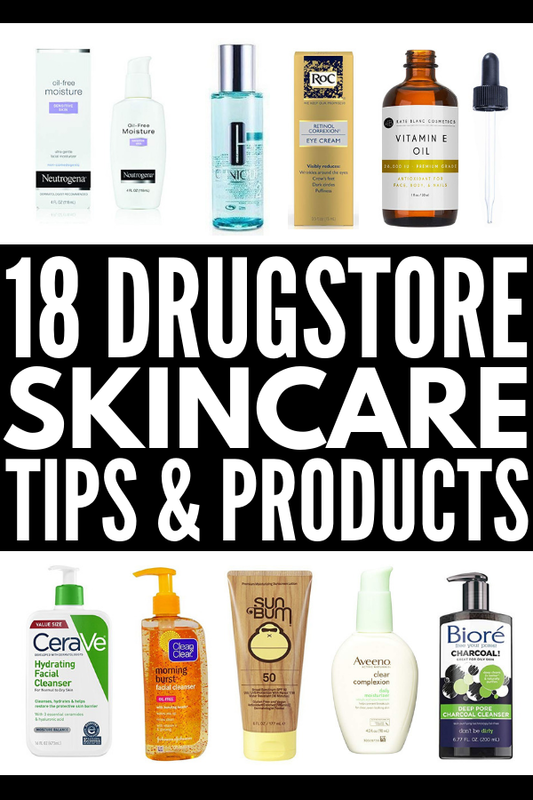 If you loved this post on the best drugstore skin care products, we’d love if you shared it on Pinterest! And if you’re looking for more skin care tips and tricks, make sure to follow our Beauty Board on Pinterest!